like and I want to find them quickly. So when I’m overwhelmed with possibilities, I turn to sources I can trust. For example, if I’m in a new city, I might chat with the concierge at my hotel and explain to him the kinds of places I like so he can give me personalized recommendations, or I’ll ask my friends for local recommendations because I value their opinions and we have similar tastes. But finding trusted advice is hard; wouldn’t it be great if there was a way for me to get these recommendations all the time, everywhere I go? 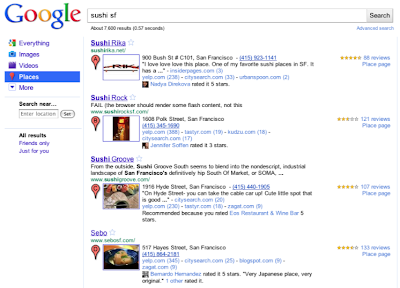 Google Places - These are the 50 million places around the world for which we have rich details. 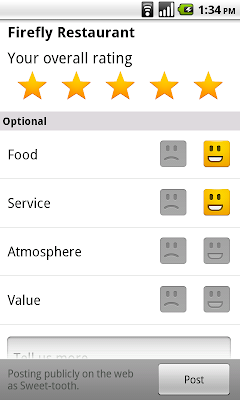 The places you like - When you rate places you like, we’ll tell you about other related places you’ll love. 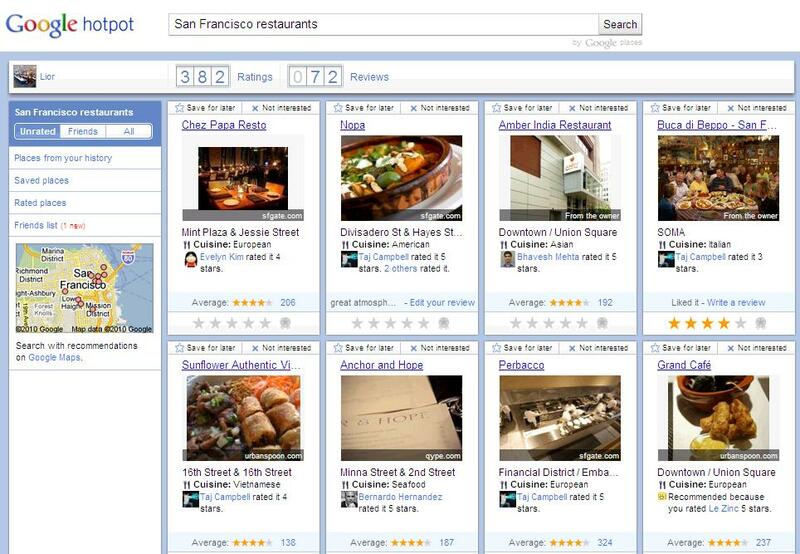 I love my favorite neighborhood restaurant in Noe Valley, Firefly, so when I rate it 5 stars, Hotpot will try to recommend other places for me in the city with simple, homey food such as Home restaurant. 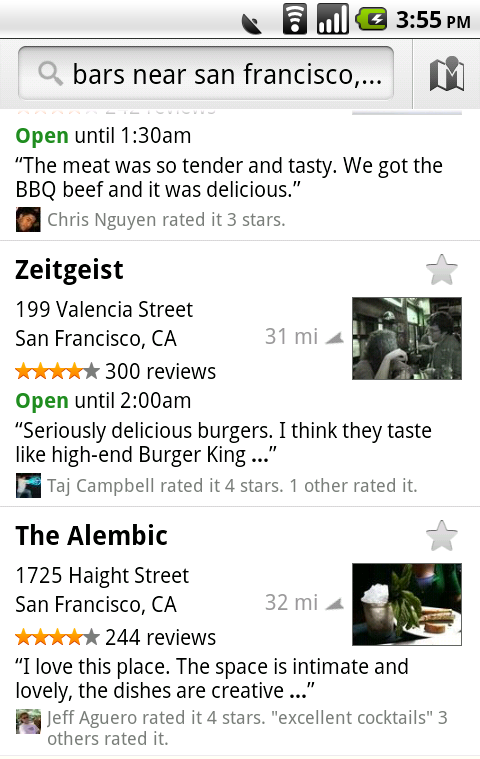 The places your friends like - Share your ratings with your friends and see the places they’ve recommended. 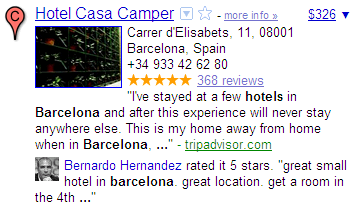 I’m planning a trip to Barcelona for the holidays and my friend Bernardo is a local. 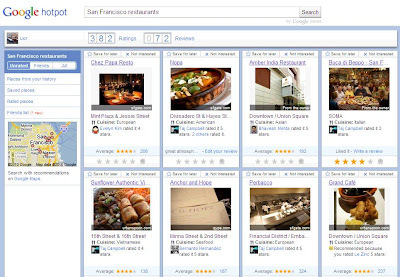 With Hotpot, I can see his recommendations when planning my trip on Google Maps, or when I’m in Spain using Google Maps or Places for Android. Combining these three ingredients makes the hard task of choosing where to go easy; all you need is to rate places and add your friends. To do that we created the Hotpot rating app: quickly rate all the places you’ve been to and choose exactly which friends you want to invite to Hotpot. Then, when you’re visiting places, you can continue rating on the go from Mobile maps on Android. 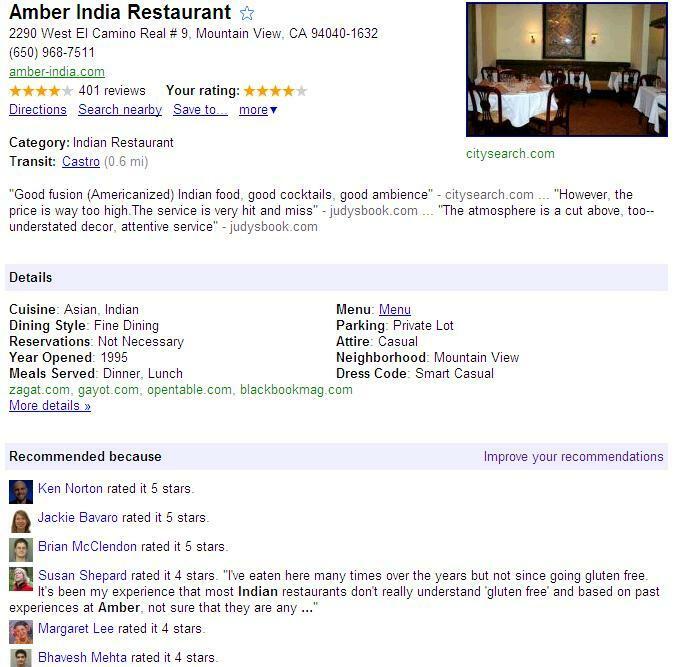 Your recommendations are with you whenever you need them. 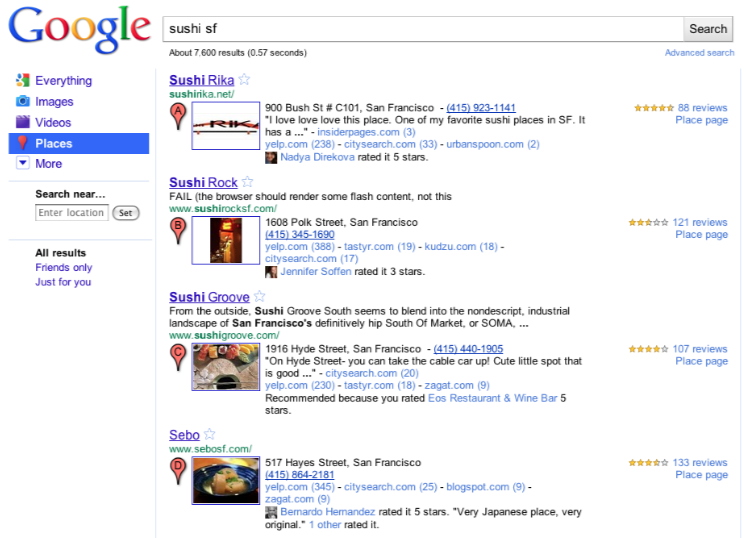 In search results, you can see recommended places by using the new Place Search and clicking on the “Places” filter. You can also see recommendations when searching on Google Maps, Google Maps for Android or when checking the Place pages for a specific business. 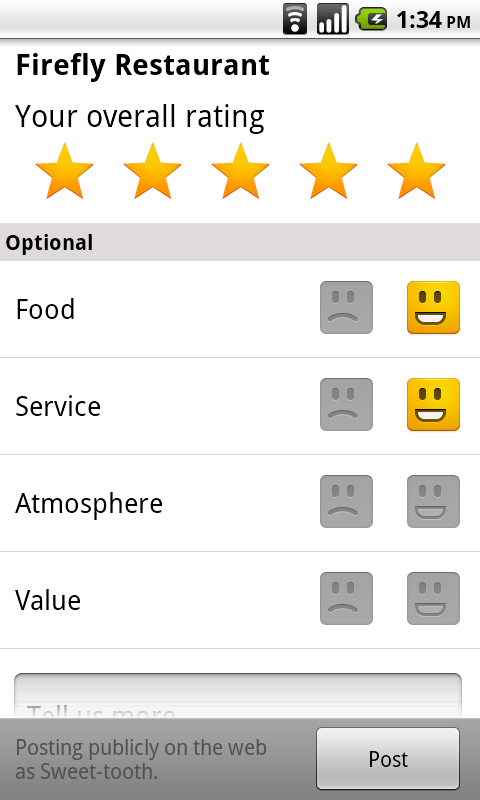 You can set a Places nickname (here’s how) when you start using Hotpot, so you control how you post your ratings. That way, only your friends will be able to see your real name. There’s something so exciting about discovering new places. Nothing beats finding a great new place I’ve never been—whether it’s a new bakery with a special dessert, a hole-in-the-wall Mediterranean place I didn’t notice before or a local art gallery where I can let my imagination roam free. The challenge with finding those great places is that each of us has different tastes. I want to find places I like and I want to find them quickly. So when I’m overwhelmed with possibilities, I turn to sources I can trust. For example, if I’m in a new city, I might chat with the concierge at my hotel and explain to him the kinds of places I like so he can give me personalized recommendations, or I’ll ask my friends for local recommendations because I value their opinions and we have similar tastes. But finding trusted advice is hard; wouldn’t it be great if there was a way for me to get these recommendations all the time, everywhere I go?